These smoothies are a healthy meal in and of themselves. 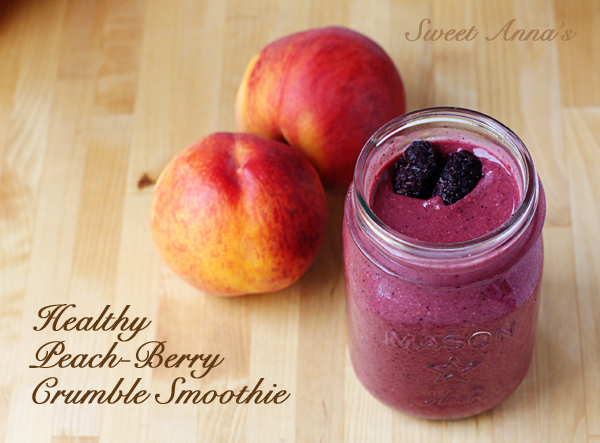 All the sweet, luscious flavor of a summer-fruit smoothie and a juicy, peach berry crisp, without any of the guilt. Chia seeds and coconut oil give you the healthy fats your body craves, and no one (ahem, toddlers!) will ever know there are fresh greens packed inside their treat! I don’t know about you, but my kids just don’t really eat too many green foods willingly. And any way I can sneak more good-stuff into their tummies is a good thing! A fun, sweet-tooth satisfying summer treat... with no guilt. All the juiciness of a delicious peach-berry crumble, in a super healthy, dairy-free, gluten-free, sugar-free, and flavor-FULL smoothie! * The liquid amounts will vary depending on your blender. If you own a super-powerful vitamix, for example, you can probably get away with less milk and no water. If you own a wimpier blended (like I do!) you will need to add enough water to get everything blending to the consistency you like! Dump the oats into the dry blender and process until quite finely ground. Add in the rest of the ingredients in order, except for the water, and blend... adding more water as needed to get the smoothies to the consistency you like.